There's an awful lot of content out there on YouTube and sorting the wheat from the chaff can be a serious undertaking. 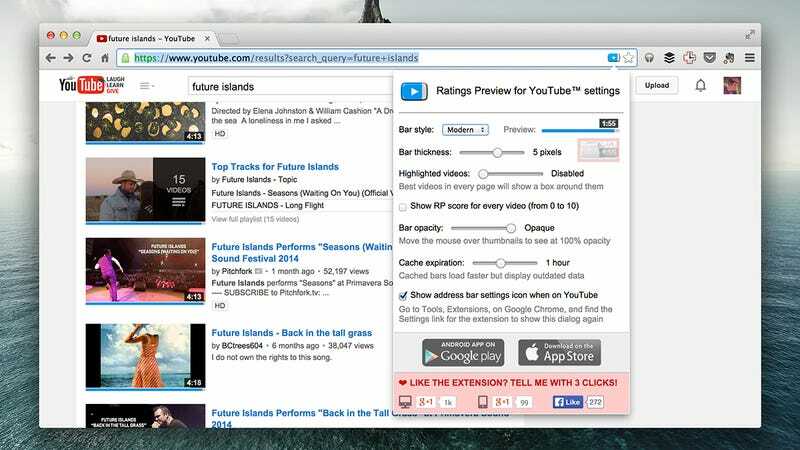 One way of making your video browsing smarter is to install the unofficial Ratings Preview extension for Google Chrome; it rather handily shows the rating for a clip right alongside every thumbnail, making it easier to pick out videos from search results. With the extension installed and your YouTube pages refreshed, a small blue bar appears underneath thumbnail, indicating how liked or disliked the video is by other YouTubers. And they can be trusted, right? You can change the style of the bar and tinker around with various other options by clicking on the extension icon in the Chrome omnibox. Another interesting feature is the option to have the best videos on any given page highlighted with blue borders (you can highlight between 1 and 8 top videos). If you're not looking for anything in particular and need some recommendations for what to watch, whether it's from the site front page or a particular channel, then enable the option in the plug-in's settings. The extension can also display a rating out of 10 for each video calculated using a special algorithm. This can often be more telling than the rating given by YouTubers, especially when there are a group of clips with a similar score. To see the rating out of 10, tick the box marked Show RP score for every video. Again, you'll need to refresh the page to apply the changes.